The Village Den is a better than competent diner in NYC (on west 12th street, I can’t find a website). Better than competent, almost good enough to be a N.J. diner, but at least it is a reasonably priced dining oasis in a neighborhood where meals can be so expensive many restaurants now offer financing plans with dinner. 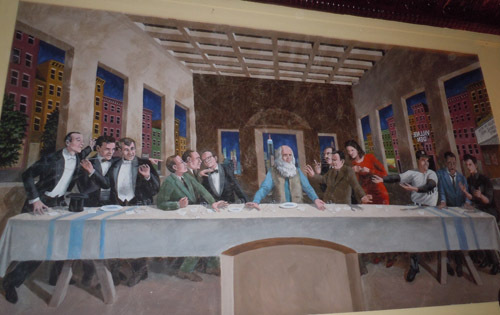 The restaurant has this mural – I can’t find that the name of the artist – that is a reimagined Last Supper by Leonardo Da Vinci and at the table are famed New York Luminaries Frank Sinatra, Joe DiMaggio, Sammy Davis Jr.
Judy Garland and Jackie Kennedy Onassis are oddly the only woman, oddly because the artist could only think of two representational NYC celebrities (the biasis the artists, not the city it celebrates). 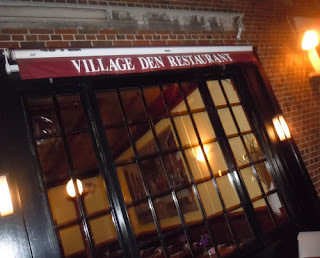 The long haired gent in the middle – the only dressed casually, bohemian style – in the Da Vinci painting he occupies the seating pattern of Jesus – is the owner of the Village Den, or so the employees told me the night I snapped these shots. The inherent chauvinism of N.Y. is on display in this mural –the capital of the world – seems everyone of these celebrities push the limit of acceptable level of arrogance. They also invoke the imaginary gold age of the town. 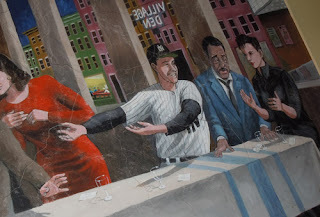 On the surface one might think the joke is that all these celebrities actually once gathered in one place, but maybe the real humor is the notion they all gathered at this diner, dressed to the nines – except for DiMaggio, who wears Yankee pinstripes. I guess the artist was a little wary that DiMaggio could be recognizable out of uniform, as if there never was a Mr. Coffee. It is funny to imagine Joltin Joe bereaved about Marylyn, forever Jealous of Arthur Miller, showing up at a Village Den party in his baseball suit years after his career ended. Well, DiMaggio had identifiable garb. In case these depictions strayed too far into unintended caricature, a “place holder,” with each celeb’s name is in view in the painting. 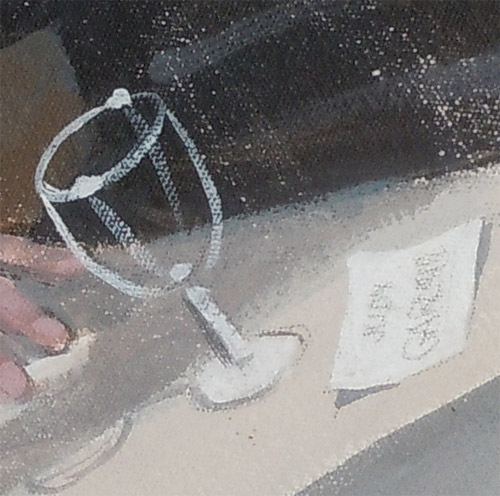 The painting reminds me of Rock Dreams. This book of illustrations by Guy Peellaert was a big deal. I never owned a copy, but we would look at in book stores like Brentano’s for hours. The illustration style was photorealistic – you could tell who they were, but the characters were placed in settings evocative of their image (I think the Velvet Underground were shooting up in the alley). It was the era when Rock stars were not only celebrities, they weren’t all over the place. The radio, Rolling Stone, that was it, unless you went to see them Live. There was no MTV or VH1, even a People magazine story was a rarity. Occasionally they might appear on The Tonight Show – Ed Sullivan was long cancelled – but even then it was not every episode of the show and it was only a song or two, not the entire broadcast. Records were the main diversion from our teenage despair and the artists who made those Wonder Years albums existed mainly in our imagination. Rock Dreams was our imaginations made real, luckily coinciding with the implied marketing image. Peellaert also did the covers for Diamond Dogs and It’s Only Rock & Roll, and I think Moondog Matinee, or that may have been a Peelaert rip off. A similar intention seems behind the Village Den mural. A Manhattan golden age – when New York celebrities all seemed just like us – a past that never existed outside of our dreams.